The Stevia Story – A tale of incredible sweetness & intrigue by Linda and Bill Bonvie and Donna Gates. Just as its title says, this book tells the complete story of this sweet herb from its history of use with the Guarani Indians to its ‘rediscovery’ by much of the civilized world and the campaign against it carried on by the FDA. Also included are nine recipes and a description of the various forms of stevia now available. $6.95. To order, call 800-511-2660. The Stevia Cookbook: Cooking with natures calorie-free sweetener by Ray Sahelian, M.D. and Donna Gates. Okay, now that you know what stevia is, how do you take advantage of it? This is your answer; over 100 stevia recipes covering a complete variety of dishes from breakfast and dinner fare to appetizers and desserts. $13.95. To order, call 800-511-2660. 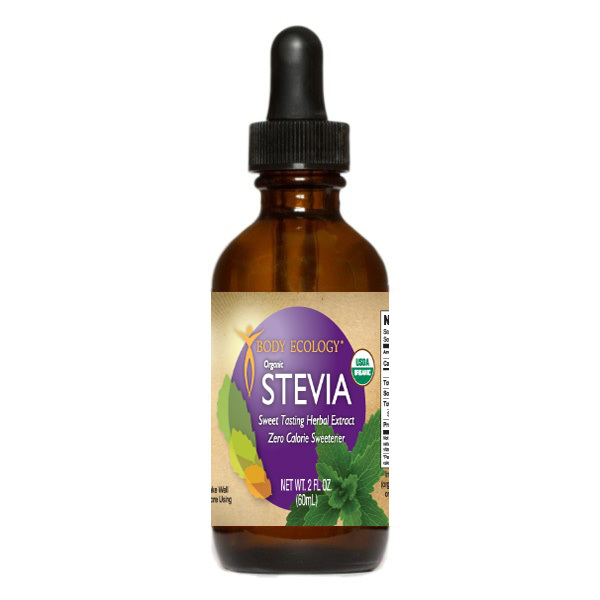 Premium stevia in liquid form preserved with grapefruit seed extract in a dropper-style bottle. $19.95. To order, call 800-511-2660. Cooking With Stevia: “Nature’s answer to sugar-free and chemical-free cooking.” Check out the “stevia kitchen” for some great recipes, stevia books, and the stevia petition. The “Stevia” team, Southern crop protection and Food research centre of Agriculture and Agri-Food Canada in London, Ontario. The Cultivation of Stevia, “Nature’s Sweetener” All about growing stevia in southern Ontario from OMAFRA, the Ontario Ministry of Agriculture, Food and Rural Affairs. Stevia.info A non-profit project dedicated to providing accurate and credible information about stevia, the all-natural, zero-calorie sweetener. Sir, I’m from Mandi Himachal Pradesh and want to grow stevia. please let me know how to initiate! Can Stevia or Truvia be added to plant nutrients to sweeten the fruit? I am growing hydroponic tomatoes and would like to sweeten them. I have heard some growers add molasses to sweeten vegetables. I am interested planting stevia in Nigeria, how do I get it? I bought boxes-packets of stevia at Aldies. It’s Nasty. It’s bitter. Not sweet.